This weir on the River Dove above the village of Low Mill was the source of the water for the ‘Low Mill’ after which the village is named. 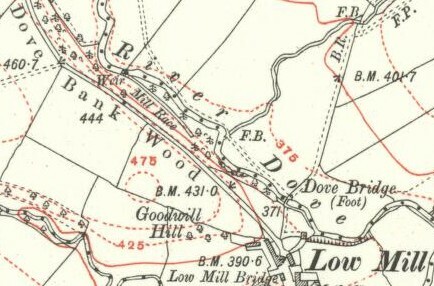 The weir and mill are now disused, but a mill race is shown on old maps on the west bank. On the 1854 6 inch map (published in 1857) the Mill is still marked and I assume in use as it isn’t marked as disused. I visited Farndale twice within a 3 week period and on my first visit I saw the sandstone wall/ dam. But on my second visiting, the structure had been tore down and all the bricks were by the side of the river. Its unusual because I’m sure it was listed as a Grade II building and I cant think of any reason why someone would want it down. It’s a shame really because it’s been there for as long as I remember. It was decided to remove the weir to also enable fish to spawn up-river. The weir was not on the National Heritage List for England (NHLE).